2012 Seat Toledo review | What Car? The Seat Toledo is a new hatchback that will sit between the Ibiza supermini and the forthcoming Leon in the companys range. Its actually bigger than both of those cars, yet its expected to start at around 12,500 for a 1.2-litre petrol model; the new Leon, by contrast, will be priced from around 15,500. When the Toledo goes on sale later this month, buyers will also be offered turbocharged 1.2- and 1.4-litre petrol engines and a 1.6 diesel. Meanwhile, a more powerful 1.2 turbo will join the line-up in January and a lower-powered 1.6 diesel in mid-2013. The Toledo is the sister car of the Skoda Rapid, which we drove a couple of months ago. Whats the 2012 Seat Toledo like to drive? We tried the more powerful versions of the diesel and the 1.2-litre turbo petrol, both of which produce 103bhp. The diesel is gutsy enough in the mid range, but it feels distinctly flat if you let the revs drop below 1500rpm and it transmits quite a bit of vibration through the pedals at all times. Unless you do a lot of miles, the 1.2 turbo is a better option because it has a broader spread of power and is both smoother and quieter. Whichever engine you choose, the Toledo combines well weighted steering with good high-speed stability and decent body control in corners. However, its front tyres run out of grip surprisingly early, so it isnt as agile as a Ford Focus or VW Golf. You also pay for that decent body control with a firm ride; the Toledo thumps over bumps and never really settles. Some wind noise builds up around the door mirrors at higher speeds and you can hear the rear suspension working on poorly surfaced roads. 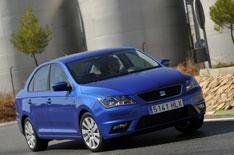 Whats the 2012 Seat Toledo like inside? There are signs of cost-cutting in the cabin because its built from hard plastics and the door trims scratch quite easily. However, everything feels reassuringly solid, and the dashboard layout is simple. Most people will be able to find a good driving position, too, thanks to the wide range of adjustment on offer. Unfortunately, the seats are flat and short on support, so backache can set in on longer journeys. More positively, rear legroom is vast, and only passengers that are more than six feet tall will wish they had more headroom. The Toledos 550-litre boot puts some cars from the class above to shame. Its just a pity the tailgate is heavy to shut and the rear seats dont fold down completely flat. In its cheapest form, the Toledo is priced to undercut many superminis. However, the petrol and diesel models that we drove start at 15,150 and 16,640 respectively. For the same sort of money, you can have comparable versions of the Hyundai i30 and Kia Ceed. These cars arent as spacious as the Toledo particularly in the boot but we reckon they represent better value overall because they counter with more upmarket cabins and superior comfort and refinement. Company car drivers should also be aware that the cleanest versions of the i30 and Ceed emit less than 100g/km of CO2, whereas the most efficient Toledo can manage only 104g/km.